I really don’t know how people taught before the internet. Luckily, I don’t have to! I found some beautiful “end behavior” cards on the amazing Amy Gruen’s blog, “Square Root of Negative One Teach Math“. I doubled the set, adding the number of roots (real and imaginary), as well as direction and wanted to share them back out. I passed them out to review end behavior and roots, but I wish I would have had these as a discovery lesson to introduce the concepts. The amazing Amy is some sort of card sort savant. I also saw a Desmos card sort that I can’t wait to explore. 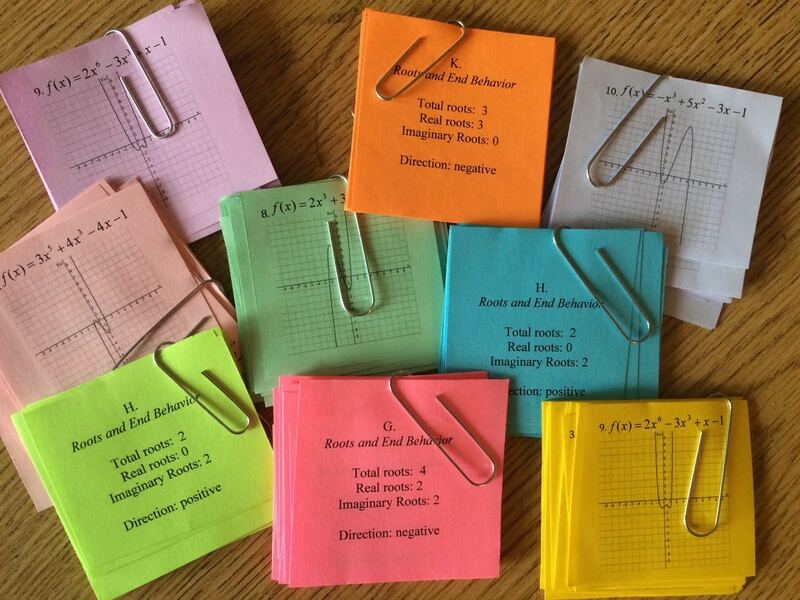 Polynomial Roots and End Behavior Cards (these are just the word cards, the graph cards that go with them can be found on Amy’s blog.) Thanks Amy! This entry was posted in Algebra 2 and tagged card sort, end behavior, polynomials, roots by I Speak Math. Bookmark the permalink. Is there any way to get the graphs without paying for a membership to Scrib? I’d love to use this activity with my class. I could draw them myself, I suppose, but it would be nice to be able to download them since they’ve already been done. You can upload a document you have created to get a free download. But it has to be an original document not one you have copied and modified. how doy you download with paying membership?